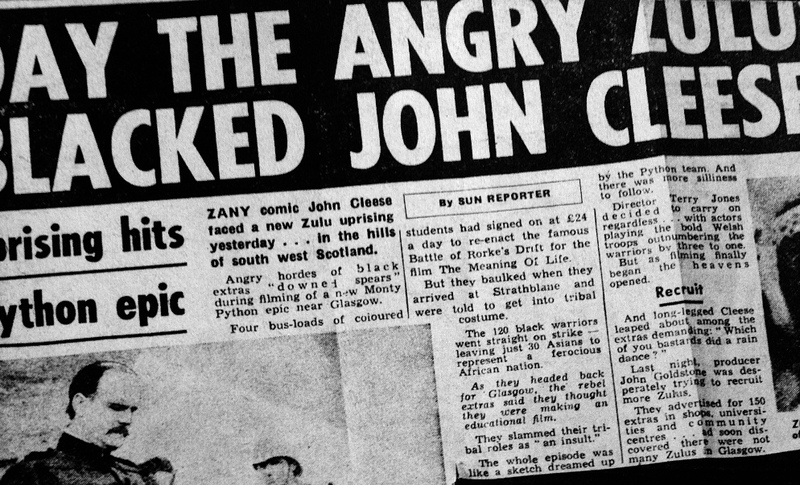 In 1982, British tabloid The Sun reported that filming on Monty Python's The Meaning of Life had been marred by an incident involving John Cleese and a group of extras dressed as Zulu warriors. According to the article, Cleese, frustrated that bad weather was slowing the shoot, had "leaped about among the extras demanding 'Which one of you bastards did a rain dance?'" 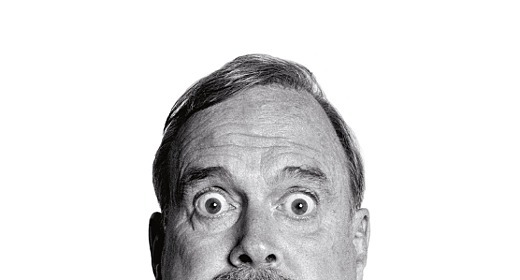 Cleese's reaction to the story can be seen below, in the form of a fruitless chain of correspondence between him and the newspaper's managing editor, Kenneth Donlan. He later reported the incident to the Press Council; they agreed and his complaint was upheld. Cleese also kept to his word and reprinted the letters in the book of the film. I am afraid I have to write to you again to complain! I hope this will not become a habit. You wrote a story on Friday about a rather funny situation that arose during the Monty Python filming in Scotland last week which you got pretty right. 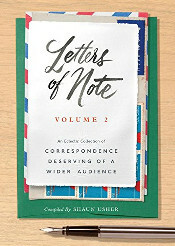 However, in paragraph 3 from the end of the story, you say "And long-legged Cleese leaped about among the extras demanding, 'Which one of you bastards did a rain dance?'" Now this is a total invention of your writer. I never mentioned the words "rain dance" nor did the thought cross my mind. Neither did I "leap about", nor refer to the extras as "bastards". So, the first grounds for my complaint are that the paragraph is completely untrue. The second ground for complaint is that, in the UK where there are racial tensions, it does not help my career to have attributed to me a remark which a lot of people would feel was racialist. I know what happened. I am a zany madcap comic, and your writer thought of the joke and decided to attribute it to me. It may be a minor matter but I do think is is quite unprofessional. I am sorry that it has been necessary for you to write to us complaining about one of our news stories. I have made enquiries with the correspondent concerned. He says that he reported the remarks accurately and in their proper context. The reporter adds: "The remarks were not attributed to any racial group whatsoever and were generally in a voice of frustration." I hope that this observation helps to clear up any impression that this story put a racist slant on your comment. This was in no way the case and everyone in this office is constantly reminded of the necessity to avoid any hurt to any section of the community, particularly minorities. With every good wish to you and all who make Monty Python. Thank you very much for your very kind and understanding letter. 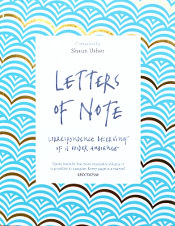 I think somewhere along the line you may have missed the point of my letter, which was not that the remarks were inaccurately reported, or that they were not in their proper context, but that I did not make them at all!!! However, I am sure that your correspondent is implying that I did. So I have a little suggestion. Whether or not I made these remarks can be established because there were so many witnesses around, all of whom spent the day within a few yards of me. Anyway, what I suggest is that if your correspondent can show that I made the remark I should pay a sum to the charity of your choice. However, if the witnesses establish that the first they heard of the comment was when somebody read it in The Sun the next morning, then The Sun should pay a sum towards Cancer Research, specifically the charity run by my friend Rob Buckman. I have told him about this idea and he is rather excited. I do hope you will agree. I don't know what sort of sum would be appropriate, but how about £10,000? I regret the delay in answering your letter which I found on my return from holiday. Your suggestion for a contest certainly has merit but is not really practicable. Our correspondent still claims that the words were said as he reported them, and you insist that you were not the speaker. The young man is reliable and there seems no chance of reconciliation. His reporting has not been under fire previously. The remarks were reported to voice the frustration which the weather was causing. Perhaps you will let me know of any other original ideas that might help us to come to an amicable solution. You ask me for another idea to resolve the problem. Well the problem is, put bluntly, that your correspondent is lying through his teeth (extremely uncomfortable position). Now, as I have said, I have sixty odd witnesses. How can I use them to convince you? Shall I ask them to write individually, or would a list of signatures on one letter suffice? I do hope, like you, that we can settle this amicably. PS I hope you have no objection to our including this correspondence in the Monty Python book of the film. PPS A correspondent of mine tells me you were recently seen running stark naked down Fleet Street shouting "Enoch Powell has a glass leg". Is my correspondent by any chance distorting the facts? Thank you for your letter of 6th October, 1982. Our correspondent sticks to his version of events and I feel that there is now no more for me to contribute to our exchange of views. I must add that we do not wish this correspondence to be included in the Monty Python book of the film. Thank you for your letter of 14 October. I am sorry you feel you have no more to contribute to our "exchange of views". Now I should remind you that your "view" has been printed in your newspaper, and my "view" has not (not much of an "exchange" really). And yet, now, you don't want me to print my version. Mr Donlan, what about the freedom of the press? Or is it only your press that is free, and not mine? Is it equitable that you should print what I didn't say, while trying to stop me printing what you did say? Does it occur to you that this could not possibly be a moral position? I feel, however, that this kind of gentle chiding will get me nowhere. My faith in the professional standards of the popular press is again shaken. So I am afraid I shall have to pursue some other avenue.